In the first part of this article, I briefly discussed a rather painful early trading experience during the financial crises in 2007/2008. I was short and still somehow killed my account. I let my emotions dominate my trades earlier in my career. My self-worth was tied to each dollar made or lost. I was many things back then. Too eager, too risk-loving, too young. Eventually, learned that my trading career is like a war that never ends. Every minute of trading is a battle with others trying to separate me from my money. If we fail to manage our emotions, we become easy targets. After blowing up my account multiple times, I learned some very painful lessons. As promised, I will share with you my framework to keep psychologically sane while trading and also what to do when off balance. The key is to prevent yourself from being off center psychologically. Once you let emotions take over, it is time to stop trading. There are a few guidelines I have developed over the years that I follow day in and day out. It has helped tremendously. Prevention is also my number one goal because once you self-destruct, it will take much longer to gain back what you lost. 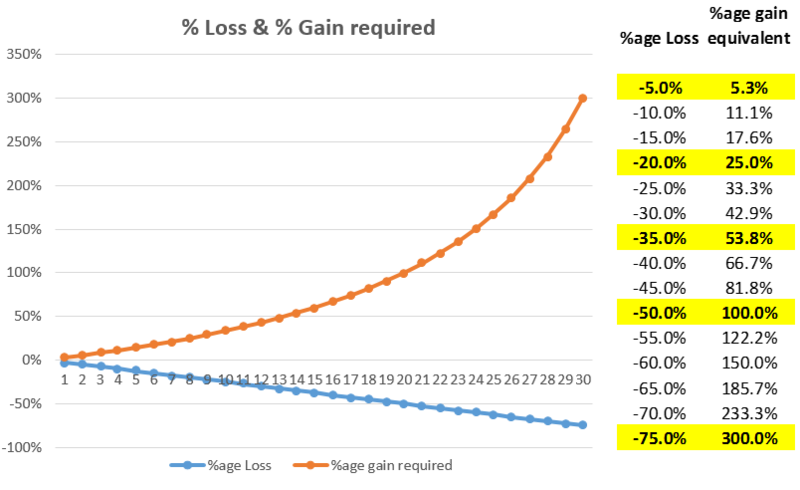 Below, the orange line shows the corresponding gain you need to offset a particular loss (in blue). Here are my processes for prevention. I look at these every day before and after trading to make sure I’m inline. Set realistic goals – my goals have nothing to do with percentage returns or amount of money to make. They should fully be within my control. It is crucial to develop a trading strategy that fits with your personality which makes it easier to abide by your trading plan when things get tough. Know where to enter, exit and think about how you will react under various probable scenarios are before making any trade. Absolutely do not trade first then plan later while staring your fluctuating account balance. As long as I follow my guidelines, I have achieved my goals. Space out your day – I set hourly alarms to remind myself that for certain times of the day, I should be taking different types and amounts of risk. For instance, from 11:30am-3pm EST, I am rarely trading and if I am, my risk is minimal. I generally risk about 1-2% of capital on trades during heavier trading times and only 0.25%-0.5% during the lunch hours. Having an alarm go off every hour also helps me to refocus and follow my trading guidelines. Take a break if performance is subpar – I stop trading for 1 hour after 3 losing trades in a row and stop trading for the day anytime I lose 5% of my capital. I stop trading for 2 days if I have 3 days in a row of losing trades. If performance continues to be poor, I decrease risk limits to 0.5% per trade. Additionally, I also skip 1 day of trading if I am up more than 10% of my capital in 1 day because I tend to take stupid risks following big wins. Remember, you don’t get paid for the number of trades you take and you don’t always have to trade. Rather, it is extremely important to have no positions on most of the time so you have a better chance of staying objective. Monitor yourself – Always take notes on each trade so you can improve faster. How did you feel before and after making the trade? Were you nervous, regretful, angry, excited? You will be surprised to see familiar patterns forming over time and you will know how you should feel when you are in the right or wrong trades. For me, I don’t trade or dabble in tiny positions when I am sick or feeling unwell. Why go into battle when you are not 100%? STOP – Take a break right away if you are feeling off center or are trading recklessly. Close your trades and take a 10-minute walk/break. You’ll thank yourself later. After all, there are 250 trading days every year and 10’s of thousands of trades to go. Don’t try to hold on and make all your money back today or try to hit a home run the very next trade. Reassess – Have a think about why you lost money. Did you follow your trading plan? Can you do something to improve your strategy? If the market is too volatile or acting strangely, I sit out and watch the market for a few days just to get my feel back. I get very excited when I can learn from my losses and improve my strategy for future trades. No strategy works forever so you must routinely step back, study your recent trades and try to make adjustments. Trade smaller – After a string of losses, I force myself to trade much smaller, risking only up to 0.5% each time. It’s better to add to the positions later when they are profitable and during a consolidation period. Call on other experienced traders or friends to talk about your situation and hopefully they can provide valuable perspectives. There are many coaching services which can keep help to keep your psychology in line. Finally, taking a break doesn’t mean giving up. Every time I have taken a break and reviewed my mistakes, I have come back stronger. Through self-improvement over tens of thousands of trades, you will gain confidence in your strategy and in yourself. By using this as a guide, I hope you also will find your unique path to skillful and calmer trading.